Udhayanidhi Stalin is producing the film under his own banner, Red Giant Movies. Story by Ajayan Bala and Music by Santhosh Narayan. The film is released by Fox Star Studios. 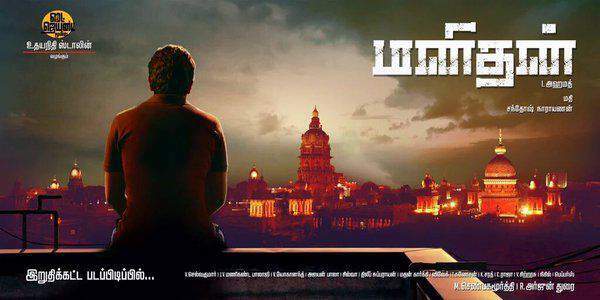 Take a look at Manithan Review before you rush yourself for tickets. In case you didn’t know, it is the remake of the Hindi Movie, Jolly LLB, Arshad Warsi, Amrita Rao and Boman Irani is the lead roles; the film did make an impact at the box office. Udhaya Stalin as Sakthi and Prakash Raj as Adisheshan are two lawyers. Sakthi is a newbie and gets his hands on a big case of a politician. But he can’t win this one because of Adisheshan. He has to shut the defense lawyer, Adisheshan and it happens in the most unexpected way. The story is pretty straight forward, but what made the script exceptional is the performance of Udhaya Stalin and Prakash Raj. Sakthi is an honest man and Hansika as Priya falls for him. In the end, he had to keep everything on the line to win the case. I. Ahmed managed to pull off a miracle with it. The film is getting a positive response from all critics. What do you think is driving the audience to the theaters. Let’s get the answers in the theaters. The movie is released in more 250 screens in Tamilnadu and with these positive reviews, the screen count will surely grow. As a result, the opening weekend collections will end as good numbers for the makers. Coming to the highlights of the film, Stalin and Prakash Raj’s acting, climax. Though there was a lag in the first half, the film just kicks off to a new level in the last 15 mins. Those were some nail gripping moments which decided the fate of the movie. Santosh Narayan songs were perfect. On the whole, it is a must watch film. If you are looking for some fresh story? This flick will be your pick. Let’s go for it. We would be rating Manithan 3/5 stars for the cool script. Do share your views and stay connected to see the box office collection reports. What’s your Manithan movie review? Feel free to share. Previous articleIs Sara Ramirez Leaving Grey’s Anatomy Before Season 12 Finale?